Democrats worried the messages were part of efforts to "steal" a close governor's race featuring Republican Kris Kobach, who the president has endorsed. TOPEKA, Kan. — Kansas election officials are reviewing text messages claiming to be from President Donald Trump and telling residents that their early votes hadn't been recorded, as Democratic leaders worried Thursday that they were part of efforts to "steal" a close governor's race. State Elections Director Bryan Caskey said the Kansas secretary of state's office received 50 or 60 calls about the texts Wednesday, mostly from the northeastern part of the state. Caskey said the office is trying to determine whether the texts broke a law before determining what to do next. One text says "Your absentee ballot is ready. Remember to vote for Pres. Trump's allies." A follow-up text says, "This is President Trump. Your early vote has NOT been RECORDED on Kansas's roster." It urges the voter to confirm his or her polling place. Democrats are on edge because Kansas Secretary of State Kris Kobach, the state's top elections official, is a Trump ally and the Republican nominee for governor. He's in a dead heat with Democratic state Sen. Laura Kelly after defeating GOP Gov. Jeff Colyer in the August primary by only 343 votes out of more than 317,000 cast. "The whole purpose of sending it out is to sow confusion," Ward said. "Remember, we're talking about an election that can be determined by 300 or 400 votes. So, 50 here, 50 there, 50 there, pretty soon, you've stolen an election." They called on Kobach and his chief deputy, Eric Rucker, to step aside from administering elections so that final decisions in the secretary of state's office are left to Caskey. As for the top Democrats, she said, "Their claims are ridiculous." County election officials handle the actual counting of votes. The job is overseen by an elected clerk in 101 of 105 counties. 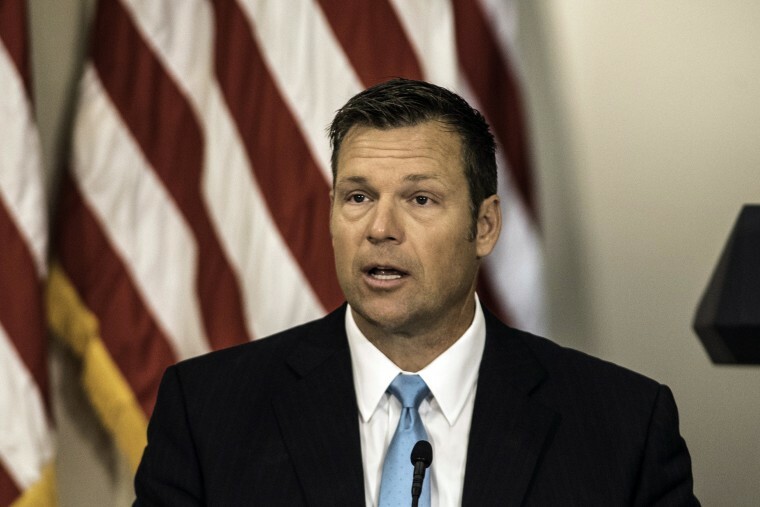 Election commissioners appointed by Kobach are in charge in the state's four most populous counties, which are home to almost half of the state's more than 1.8 million registered voters. "We're not trying to cause chaos. We're trying to make sure they know we're watching and we're not going to let them steal an election, OK?" Ward said. "This is an incredibly close election and any mistake or any action that diminishes or suppresses the vote could swing an election." The texts to voters link to a website for the Republican National Committee, and Kansas Republican Party Chairman Kelly Arnold said he suspects that's who sent the messages. He said the texts didn't come from state party officials. The RNC didn't immediately respond to an email seeking comment. "We are trying to get out as much information to our voters as possible," Arnold said. Lyon County Clerk Tammy Vopat, a Republican, said she spoke to one man who received one of the texts after voting early and assured him that his vote would be tabulated on election night. She said the texts, which she described as "bogus" were discussed Wednesday during a routine weekly phone call with state and county election officials. "It worries me that information like this is being sent out that puts doubt in our voters' minds," Vopat said.